With baby girl number three on the way, I took a respite from my regular writing to address one of my girls’ passions – their fascination with princesses. The Disney Princess Encyclopedia by Dorling Kindersley (DK) Publishing was a source and confirmation of this fascination, especially with the current live-action Cinderella movie. This comprehensive resource contains a nice balance of information and pictures. The hard cover binding holds up to constant use and the 120+-page content provides great appeal for the primary audience — ages 5 to 12. The Disney Princess Encyclopedia, edited by Jo Casey and Victoria Taylor, goes beyond a simple marketing showcase of the Disney characters and movies, though it is nice for adults to stroll down memory lane with the young ones. Practical advice on the princess’ talents, including music and clothing styles, can initiate a young audience’s interests. This book adds Mulan, Pocahontas, and Tiana (from Princess and the Frog) for a total of nine princesses expanding the Disney Princess Essential Guide, another DK book, which featured Ariel (The Little Mermaid), Aurora (Sleeping Beauty), Belle (Beauty and the Beast), Cinderella, Jasmine (Aladdin), and Snow White. 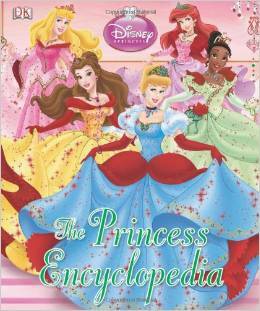 This list, which coincides with Disney’s current website listing, follows a chronological order in the book according to each princess’s movie appearance beginning with Snow White and ending with Tiana who is featured on the cover with Ariel, Aurora, Belle, and Cinderella with Snow White, Mulan, Pocahontas, and Jasmine gracing the back cover. Cases could be also made for including Princess Minnie Mouse, Nala (The Lion King), Princess Melody (The Little Mermaid II: Return to the Sea), Maid Marian (Robin Hood), Alice (Alice in Wonderland), Megara (Hercules), and Giselle (Enchanted). Some members of this group have been included in other “princess” products, but the base nine is included for now. Each princess gets a minimum ten-page spread including related information on friends, family, and more. The authors also include special asides among the princess chapters including “Spellbound” and “Faraway Lands,” then end with a corresponding prince list, and finally pair everyone up in the ending pages. This book has an easy to read design with distinctive chunks of information enhanced with appropriately matching colors and backgrounds. The visuals are sharp except for the Snow White chapter, especially a picture of her scrubbing the floor on page 10, which contain some noticeably lower quality graphics, which could have been replaced by artwork of the same scene. The origin information on each princess really provides some engaging interest as well. This resource book also lists the dreams, likes, dislikes, job, favorites, and wishes for each featured princess. Readers can remove the protective sleeve since the artwork on the hardcover is the same. Some different words like “favourite” and “colour” might throw readers for a loop, but appear because DK is headquartered in London, England, UK. The serif fonts make the book more readable. Written by Jo Casey, Beth Landis Hester, and Catherine Saunders and edited by Jo Casey and Victoria Taylor, Disney Princess Encyclopedia comes highly recommended with a simple reading level beginning at about five years old. This entry was posted in Book Reviews and tagged Books, Disney, Disney Princess, Michael Siebenaler, Mike Siebenaler, Tall Writer. Bookmark the permalink.